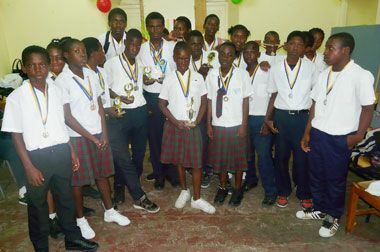 They received the coveted titles on Friday, March 18, and were presented with awards for their performances in the schoolâs just concluded sports meet. The students were awarded for outstanding achievements in a variety of sporting events, including football, cricket and athletics. Co-ordinator of the Student Support Unit Francois Creese told SEARCHLIGHT that the overall aim was to provide all students with a sense of accomplishment, particularly since the males outnumbered the females at the school. Novelty events were put on by the school such as mixed shuttle race and mixed obstacle relay to ensure that all students had a fair chance of succeeding at an event. âThese children are accustomed to failure and people see them as failures and as students who have behavioural problems,â Creese said. She contended that the school had been branded as a place for children with behavioural problems. This is not so, said Creese, adding it is a place of learning for children aged 13 to 17 who had performed poorly in their academics. The overall intent is to lift the studentsâ self-esteem, Creese added. âThese studentsâ self-esteem has taken a beating from day one,â said Creese, adding that, academically, they are weak, so the programme was staged to give them an opportunity to achieve. The students will also have the opportunity to showcase their skills when they come up against some of the nationâs top student athletes in this yearâs interschool meet. Some of the top awardees at last Fridayâs award ceremony are: 60 M – (Boys) Akeem Richards; (Girls) Kafiann Victor; 60M (Senior Boys) – Errick Pompey; 1500M (Boys) – Delano Jackson; 200M – Delano Jackson; 100M – Delano Jackson; 400M – Mickele Culzac; 800M – Delano Jackson.